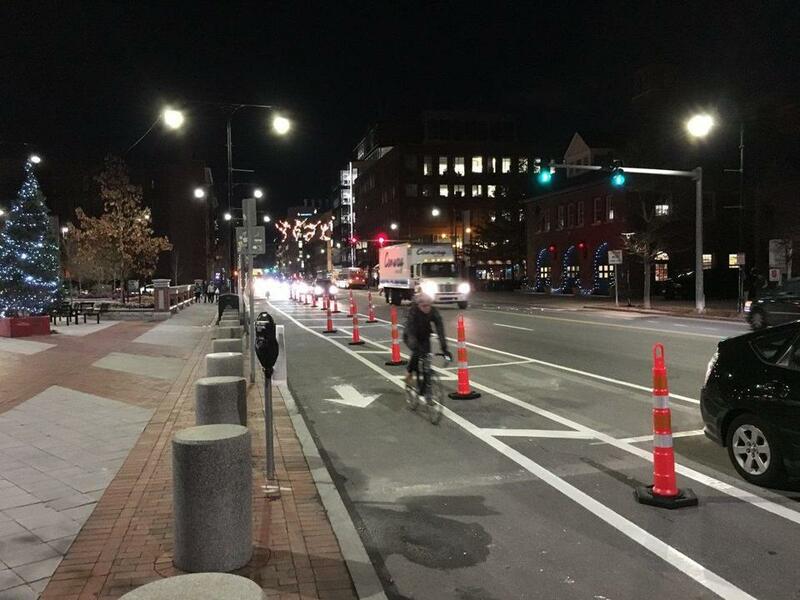 One section of protected bike lane has been installed in Central Square. Nearly two months after city officials announced plans to test new protected bike lanes along portions of Massachusetts Avenue in Cambridge, orange cones and fresh road striping have appeared along two stretches of the thoroughfare. One of the bike lanes implemented as part of the city’s “protected bike lane demonstration project” was set up Thursday on the northbound side of the avenue between Sidney and Douglass streets, a single block that cuts through Central Square. The second lane was installed on the northbound side of the avenue between Waterhouse and Everett streets, near Harvard Law School and Cambridge Common, according to the city’s website. Joseph Barr, Cambridge’s director of traffic, parking, and transportation, said the orange “delineators” — or skinny traffic cones — being used to separate cyclists from passing cars are temporary. He said permanent flexible posts will take their place in the near future. “We are awaiting delivery on those, but needed to get the roadway markings down before the weather gets any colder,” he said in an e-mail to the Globe. In terms of how long the pilot demonstration will remain along both strips of the avenue, Barr said there is no set date. The city will decide whether the lanes should be “retained or expanded” and whether further adjustments are needed, officials said. The bike lane demonstration was born of community meetings and City Council policy orders, after the recent deaths of cyclists in two of the city’s busy squares. In October, after the death of Bernard “Joe” Lavins, of Lexington, who was killed in a crash with a tractor-trailer in Porter Square, activists staged a protest outside City Hall. They demaded that officials move faster on making streets more accommodating to cyclists and pedestrians. With the pilot lanes installed, some celebrated the achievement last week. On a Facebook page for the group “Cambridge Bicycle Safety,” which is made up of residents who advocate for safer streets, members lauded the city.